When HyperX released its Cloud headset in 2014, I think most people were shocked. Here, a company with no pedigree—an offshoot of dreary ol’ corporate Kingston, no less—released a headset that not just matched those from entrenched competitors (Logitech, Razer, SteelSeries, et cetera), but in many cases surpassed them. And at a budget-friendly price. So now when HyperX says it’s getting into a new market, I pay attention. 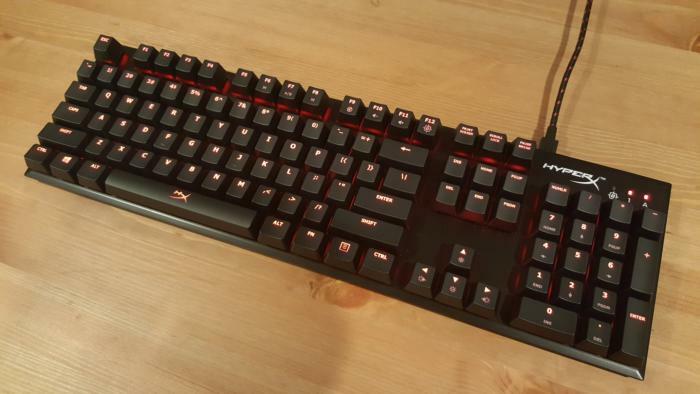 Enter the HyperX Alloy FPS, the company’s first mechanical keyboard (and its first non-headset peripheral). Like the HyperX Cloud, the design philosophy here seems to be “Focus on the fundamentals.” For headsets, that meant comfort. Here, it means a no-frills, classic-black-rectangle design—the likes of which you’ve probably seen a thousand times before. That’s really all there is to it. The Alloy is as simple as it appears. No macro keys, no superfluous design elements. It’s merely a super-compact slab of steel with the trendy exposed backplate design we’ve seen a lot of lately from Corsair, Razer, G.Skill, and others. The Alloy’s standout feature is its diminutive size. With an ultra-slim bezel on all four sides, the Alloy is one of the smallest full-sized boards I’ve ever encountered—more than an inch shorter than Razer’s BlackWidow in both directions, for instance. It’s even smaller than the sleek design that Logitech uses for its G610 and G810 lines. 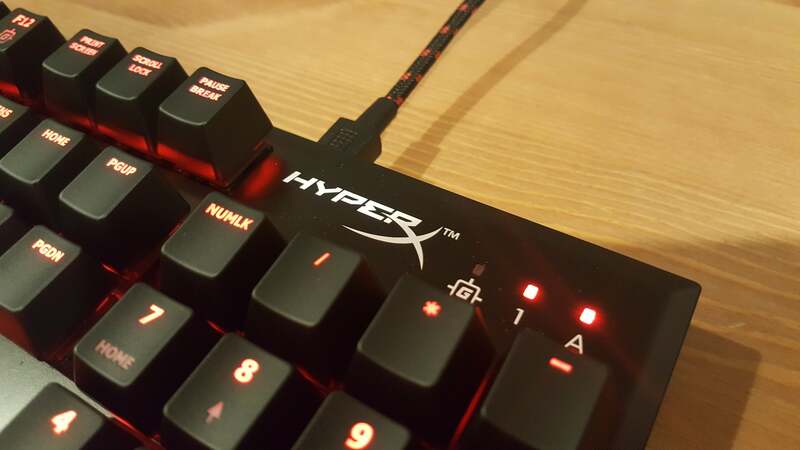 HyperX leans into the Alloy’s portability: It comes with a detachable dual-terminus USB cable that’s wrapped in red-and-black fabric and a soft bag to protect the keyboard if you need to take it on the go. 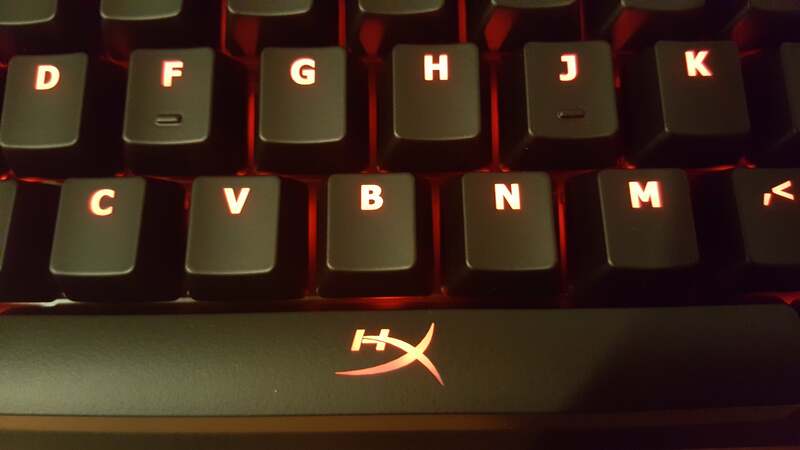 These features are aligned with HyperX’s tournament/e-sports aspirations, though I imagine average users plop their keyboard on a desk and leave it there in perpetuity. Still, if you’re looking for a full-sized keyboard (aka one with a numpad) that doesn’t take over too much of your desk, the Alloy is about as petite as you can get. 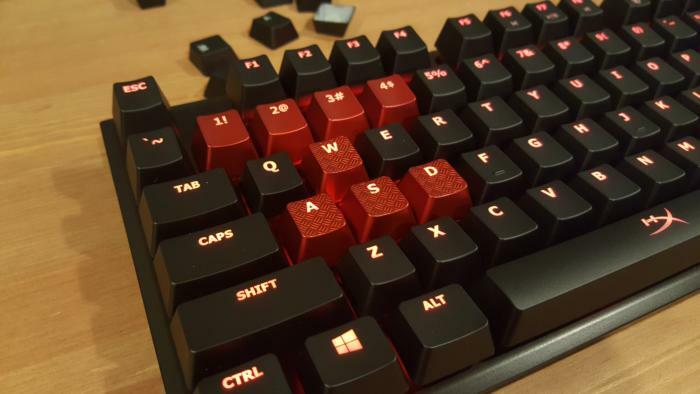 Borrowing from some other manufacturers (read: Corsair), the Alloy also includes contoured/colored keycaps for some of the standard game-centric keys—namely, WASD and the “1” through “4” keys. The WASD group gets some light etching on the key surface, while the number keys are merely a smooth red. The black-and-red theme extends to the lighting, with the standard Alloy sporting single-color red LEDs. An RGB-equipped version of the Alloy debuted at CES and will launch soon, for those who want something a bit fancier. However, you can expect it to cost quite a bit more. It’s hard to knock the single-color Alloy’s $99 price, incidentally—the single-color Logitech G610 lists at $120, by comparison. Like many keyboards, the rear of the unit features a USB port. Unfortunately the Alloy doesn’t do USB pass-through like most, instead only pushing through power. HyperX singles it out as a phone-charging convenience. Personally, I’d rather have true USB pass-through if I’m going to take up two USB slots on my PC. But as I said, it’s a pretty simple no-frills design. My only real point of concern: The aforementioned detachable USB cable is a bit short. I don’t think it’ll be a problem for most people, but as someone with a sit/stand desk, I noticed the cable barely stretched far enough to reach the rear of my PC (which sits on the floor) when I was standing. I’m going to take my standard few paragraphs to commend HyperX on going with genuine Cherry MX keys. Like the Cougar Attack X3, it’s pretty rare to see these budget-friendly boards go with Cherry nowadays when the alternatives (Kailh, Outemu, et al) are so much cheaper. But Cherry’s earned its reputation for quality, and I feel comfortable recommending them without reservations. The only downside here—if you can call it a downside—is that the Alloy is currently only available in a few variants at the moment. Blues were first out the gate, with Brown and Red models now available post-CES. 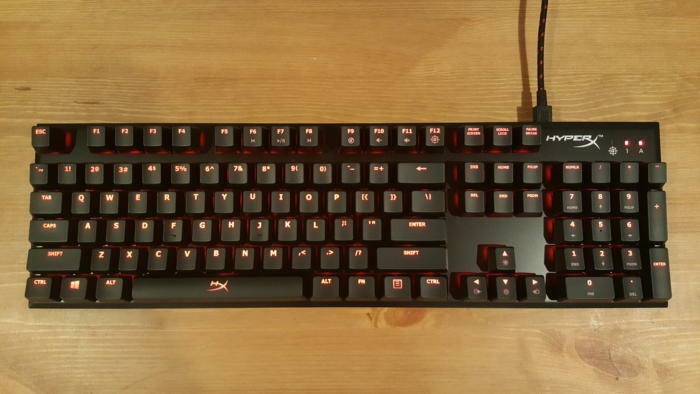 Cherry MX Blacks, also a fairly common switch, haven’t made the cut. Sorry. I expect we’ll see further versions of the Alloy later on though. HyperX has already fleshed out the product line quite a bit in just its first six months. Seems like the team tested the waters and is now in the process of jumping all the way in. It’s not quite the industry-wide shakeup that resulted from the HyperX Cloud, but the HyperX Alloy is a fine debut. It’s a competitively priced board with an attractive design, which is good enough for me. Whether it’s good enough to stand out in the increasingly crowded mechanical-keyboard market? Well, that’s harder to say. It’s not quite the industry-wide shakeup that ensued with the release of HyperX's Cloud headset, but the HyperX Alloy is a fine debut keyboard.